How do we power up the Question and Answer session? Beyond the basics of handling a Q and A session, how do we energise this session to embed the takeaway? 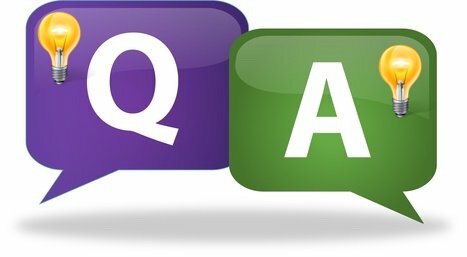 Not all Question and Answer (Q&A) sessions are created equal. Sometimes it is because the presenter doesn’t know how to handle questions, or because the audience is reluctant to ask questions (they are either shy or passive) or they ask poor (rambling or off point) questions. We could use technology (Twitter or some other live question feed) to get quality questions, but these solutions can be time consuming, complex to manage or expensive (due to the technology required). 1. Get the audience to engage each other. Ask the audience questions to stimulate thinking about the ideas and how to apply them. Get them to discuss your question with the person sitting next to them. e.g.“What was the key takeaway from this session for you, and what might you do differently based on this understanding?” This relates the content to their lives and reminds them of their personal takeaway. Unlike normal Q&A, this approach allows everybody to have their say. It can also clarify for the audience areas that still need some explanation to customise the idea for their lives. Additionally, it can help with networking in a more informal manner. 2. Ask for reactions and implementation ideas. 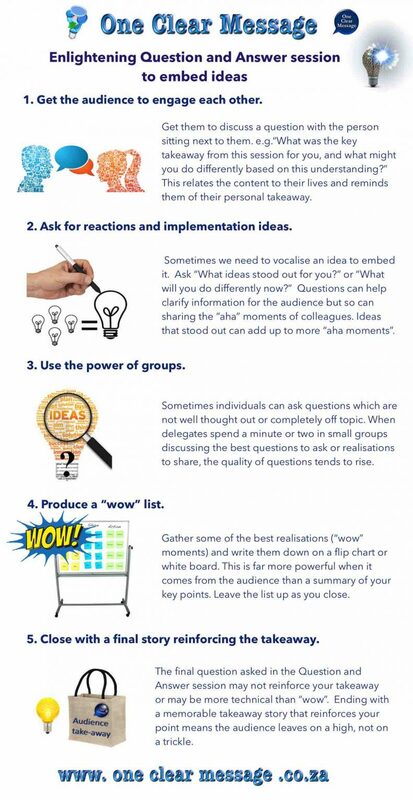 When debriefing a small group or after the audience has discussed the takeaway ideas with someone sitting next to them, ask them for a reaction (how they feel about the concept) and how they plan to implement it. Sometimes people need to vocalise an idea to embed it. When we ask for questions it doesn’t always leave room for comments or realisations. 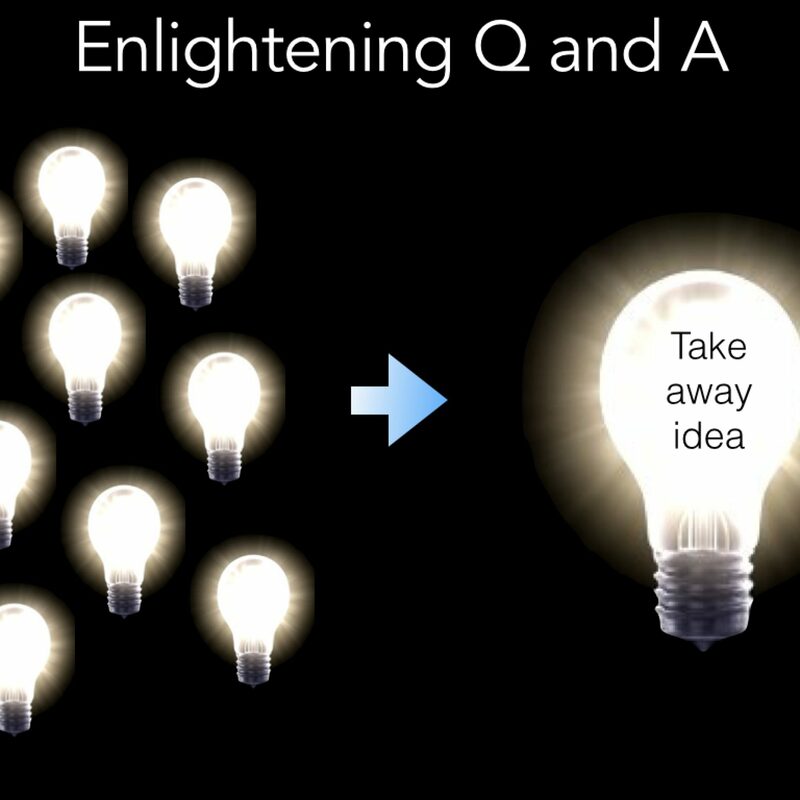 Ask “What ideas stood out for you?” or “What will you do differently now?” Questions can help clarify information for the audience but so can sharing the “aha” moments of colleagues. Be aware of timing. The larger the group the longer this will take. For a large group you may have to limit it to a specific time period or number of questions/realisations. 3. Use the power of groups. Sometimes individuals can ask questions which are not well thought out or completely off topic. Instead of asking for questions from individuals, you can ask people to discuss questions in groups. When delegates spend a minute or two in small groups discussing the best questions to ask or realisations to share, the quality of questions tends to rise. While the groups are discussing their questions you can walk around and listen as the groups talk. These questions can then be shared publicly. If you hear an interesting reflection, ask them to bring it up during the joint discussion or bring it up yourself. 4. Produce a “wow” list. Gather some of the best realisations (“wow” moments) and write them down on a flip chart or white board. This is far more powerful when it comes from the audience than a summary of your key points. Leave the list up as you close. 5. Close with a final story reinforcing the takeaway. It is best to close by reinforcing the point of the session with a powerful story which makes your point. The final question asked in the Question and Answer session may not reinforce your takeaway or may be more technical than “wow”. Ending with a memorable takeaway story that reinforces your point means the audience leaves on a high, not on a trickle.